[Glen], at Maker Space Newcastle Upon Tyne, is refreshingly honest. As he puts it, he’s too cheap to buy a proper battery. He needed a 1AH battery pack to power his quadcopter controller and FPV headset, and since inadequate discharge warnings had led him to damage lithium polymer cells with these devices, he wanted his pack to use lithium-ion cells. His requirements were that the cells be as cheap, lightweight, and small as possible, so to satisfy them he turned to a stack of mobile phone cells. Nokia BL-4U cells could be had for under a pound ($1.46) including delivery, so they certainly satisfied his requirement for cheapness. 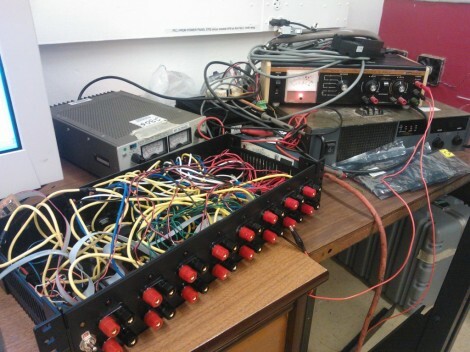 It might seem a simple procedure, to put together a battery pack, and in terms of physical wiring it certainly is. But lithium-ion cells are not simply connected together in the way dry cells are, to avoid a significant fire risk they need to have the voltage of each individual cell monitored with a special balanced charger. Thus each cell junction needs to be brought out to another connector to the charger. [Glen]’s write-up takes the reader through all the requirements of safe lithium-ion pack construction and charging, and is a useful read for any lithium-ion newbies. If nothing else it serves as a useful reminder that mobile phone cells can be surprisingly cheap. Lithium cells have captured our attention before here at Hackaday. Our recent Hackaday Dictionary piece provides a comprehensive primer, we’ve featured another multi-cell build, and an interesting app note from Maxim for a battery manager chip. While debugging a strange battery failure in a manufacturing process, [Josh] discovered a new (to us) LiPo battery failure mode. Different battery chemistries react differently to temperature. We’ve used lithium exclusively in high-altitude ballooning, for instance, because of their decent performance when cold. Lithium batteries generally don’t like high temperatures, on the other hand, but besides the risk of bursting into flames, we had no idea that heat could kill them. When the battery’s voltage is already low, though, it turns out it can. When the batteries got hot, their voltage sagged a little bit, but they recovered afterwards. And while the voltage sagged a little bit more for the batteries with lower initial charge, that’s nothing compared to the complete failure of the battery that entered the hot water with under 1V on it — see they yellow line in the graphs. There’s a million ways to kill a battery, and lithium batteries are known not to like being completely discharged, but it looks like the combination of deep discharge and heat is entirely deadly. Now you know. If choosing a rechargeable battery for your project intimidates you, [Afroman] has prepared a primer video that should put you at ease. In this tutorial for battery basics he not only walks you through a choice of 5 rechargeable chemistries and their respective tradeoffs, but gives a procedure that will allow you to navigate through the specs of real-world batteries for sale – something that can be the most intimidating part of the process. You cannot learn everything about batteries in 9 minutes, but watching this should get you from zero to the important 80% of the way there. Even if your project does not give you the specs you need to begin buying, [Afroman] tells you what to measure and how to shop for it. In particular, the information he gives is framed in the context you care about, hopefully ensuring you are not waylaid by all the details that were safe to ignore. If this is not enough, [Afroman]’s prequel video on battery terminology has more detail. Much like your high school English teacher told you, you need to know the rules before you can choose to break them. Many of battery absolute Dos or Don’ts are written for the manufacturer, who provides for the consumer, not the hacker. Hackaday has published hundreds of battery articles over the years; search our archives when you are ready for more. This is a scratch-build meter for measuring the internal resistance of Lithium Polymer cells. [Bleuer Csaba] uses the LiPo cells for RC vehicles and thet take quite a beating from the motors they’re supplying. This means that he only gets about 100-200 cycles out of each cell. To figure out where one is in its life cycle you can measure the internal resistance where a rising resistance indicates greater age. [Bleuer] mentions that you can buy a meter to do this for you, but what fun is that? Since he’s rolling his own tool he defined his own parameters for the readings. After experimenting with different loads driven for different test periods he was able to extrapolate an equation that estimates the resistance measurement. As you can see in the clip after the break, this happens very fast. All he has to do is connect the cell and press one button. The measurements are made and various data points are displayed on the quartet of 7-segment displays. If you’re building solar vehicles at a competitive level you’ve got to know exactly how the storage batteries will perform. To that end [Matthew] built a Lithium Polymer battery tester for use by the McMaster University Solar Car Project. It worked well, but could only test one battery at a time. He just finished up a second version, which can test battery specifications on up to eight units at once. It saves a lot of time, but still takes fifteen hours to test just one set of the units used by the vehicle. The most important aspect being measured is the discharge curve. Sure, there’s a datasheet that includes this information, but how can be sure that what you received will perform at spec? Each of the eight channels can be disconnected from the system using a relay. This is just one of the safety features which watch for things like over-voltage and over-current conditions. Remember, Lithium batteries can heat up fast if there’s a problem. Data is sampled on a 12-bit ADC and can be pushed to a computer via USB for graphing.